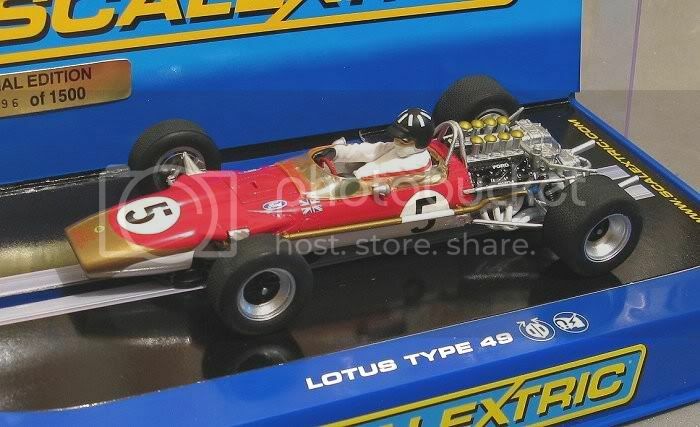 Not a new model on the scene but another milestone in slotcars none the less. 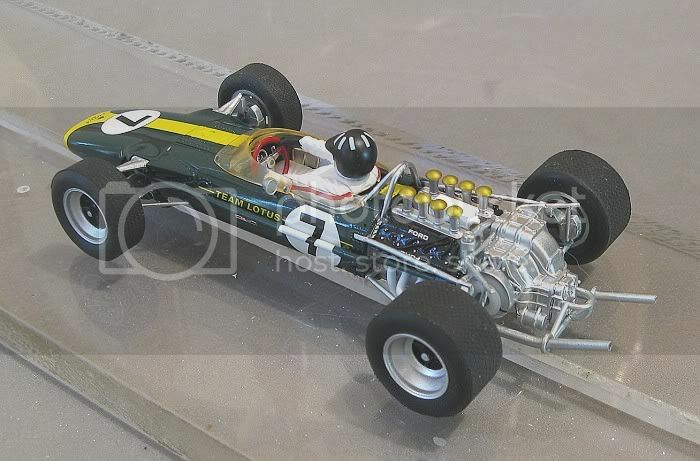 This model first appeared in the two car Lotus / Eagle twin pack but with such a prestigious pair, too few are likely to be racing them. So as expected it is a welcome relief that these models inevitably came out, giving the average Joe Blow something to put on the track, whether it be on its own or in competition. With the consumer demanding more and more detail on their models it goes as read that the current generation of slotcars are a bit fragile. At first the fragility was with the detail. An errant manoeuvre would see a delicate part of the second fixings go spiralling down the track or off into the landscaping to be lost for a six month. The simplest solution for those that could run to it was to buy two models, one for the shelf and one for the track. The fact that the track model would be devoid of all its delicate parts by the end of the season was an acceptable condition because the model was still raceable after all its tribulations, but things are changing!! The latest batch of superslotcars are delicate in more ways than detail. I first became rudely aware of this with the Scaley Cooper T53. Having got one for the shelf, I took the ‘one for the track’ to a race meeting!! I fully expected to lose some glittery bits that evening, and sure enough I did, problem one. After a high speed front ender with an unmarshalled model laying across my lane I was replace in the slot and on pulling away again, the model was decidedly sick!! A lot of tail end swishing as if something was dragging at the front. I got the model back round to my racing station and lifted it off the track. Sure enough, the front axle was crooked and the front suspension had been smashed. Not a big deal ten years ago as you would just rip the front end detail off and the model would go on its way with the axle still held central in some very robust axle mounts. But the game has changed. A lot of these new finely detailed models have vital functions held together with that fine detail. A very pretty, but vulnerable front end! In the case of the Cooper, I bought a front end set for about Au$14.00 from Scalex World which consisted of the suspension detail, the front axle and the front wheels and tyres!! Not too bad but it didn’t remove the risk from the repaired model. 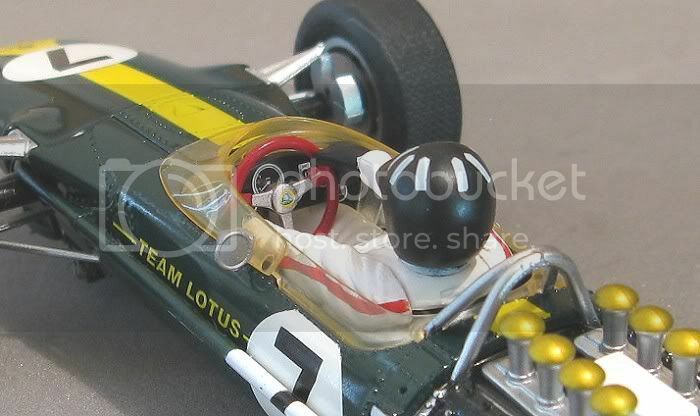 Getting back to the Lotus 49, the model has the same inherent weakness. 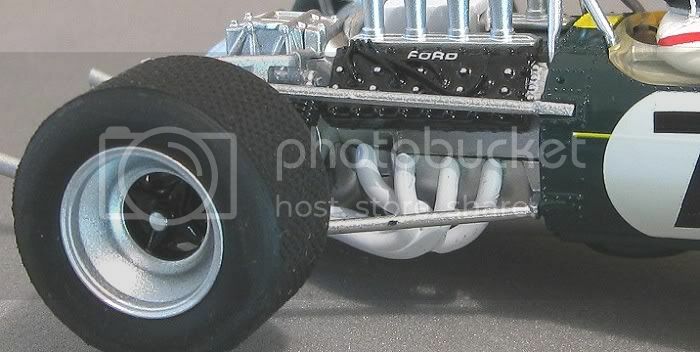 The front axle is held in by the front suspension detail and nothing else. 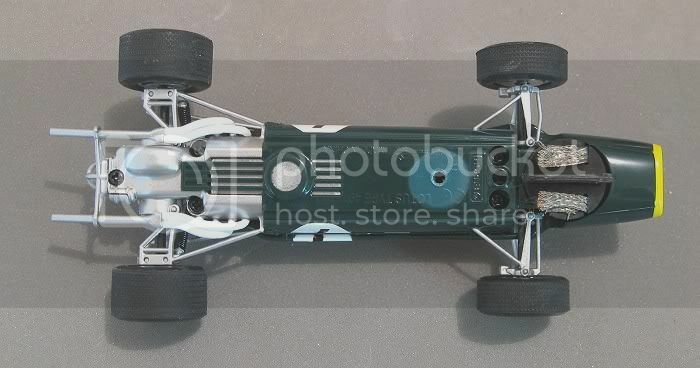 Admittedly it is a bit more sturdy than the Cooper, but all the same, in a high speed front ender on a magnet track I can see the axle coming off a poor second and the model then automatically becomes undriveable until the front suspension detail is replaced. Mmmmmmm. So, to minimise this happening, the model will probably only be raced on non magnet or board tracks for the foreseeable future. Fortunately, almost all of my racing is done on board anyway!! So, apart from the above, what are the other good and bad points of this model! Excellent cockpit detail but an annoying yellow tint to the screen?? Let’s start with the good points. The good points are first its Achilles heel which is the detail. 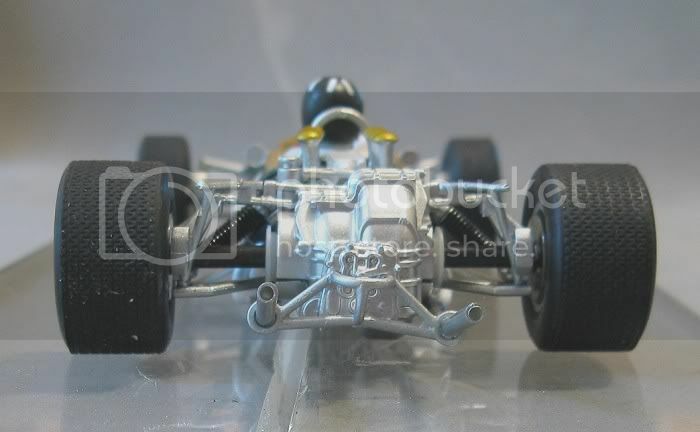 Scalextric and other manufacturers are improving year on year with their model detail. This model is no exception and the finest points are not always the most obvious. Excellent engine detail....this is 1/32!! Detail like the chrome dome nuts which hold the cylinder heads down on the real car, plug leads as part of the cam cover moulding, finely sculptured exhaust extractors, rear sprung dampers and excellent suspension detail front and rear. More obvious are the eight white bars of the Henley Rowing Club on the crash helmet, one of Graham Hills favourite institutions, and something that son Damon also used. Cockpit detail is as good as the best and one point that to me makes this model more accurate than the Tasman model, is the complete livery detail. Due to anti tobacco legislation, the highly collectable limited edition Gold Leaf model is void of the huge gold sponsors graphics on either side of the model. The final touch is, yes you guessed, the wheels and tyres. Ultra fine detailed tyres front and rear finish the model well. But, there are some brick bats amongst the bouquets!! Apart from the inherent weakness of axle mounts as we have discussed, there is the almost casual carelessness of the application of some detail. Most noticeable are the air intake ram tubes. These are decidedly out of align and where I was looking for two almost militarily precise rows of trumpets, I got one almost square and the other more than crooked. I did look at the fixing when I had the body apart, but one false slip could see the unit become decidedly second hand!!. The exhausts are crooked too! Another obvious assembly fault were the tail pipes. When the exhaust was fitted, the tail pipes are at different heights and look noticeably odd. Another look whilst apart shows these to be fixed permanently in this position and again, a high risk operation to rectify!! Interesting to note my Gold Leaf Tasman Lotus has neither of these faults. Lastly, the clear screen parts look to be very yellowish. I’m not sure if this is supposed to be or is a discolouration of the screen? I notice the Tasman car is the same too!. There is one other divergence from scale but this is unavoidable and I’m sure the average slotracer would be too young to notice that the necessity to have a decent final gear reduction has compelled Scalextric to distort the transmission casting to cover the contrate. Fly have come up with an ingenious system on their Williams FW07 which removes an otherwise ugly hump from the rear of a very attractive model. In Scaley’s case there is no spare room in this model to revamp the final drive. That remaining bit of space is for the drivers bum!! One solution for the future may be to use a finer ( and considerably smaller) pitch drive, i.e. either a 64 or a 72 pitch which would have to be modelled in metal to retain strength, you never know!! 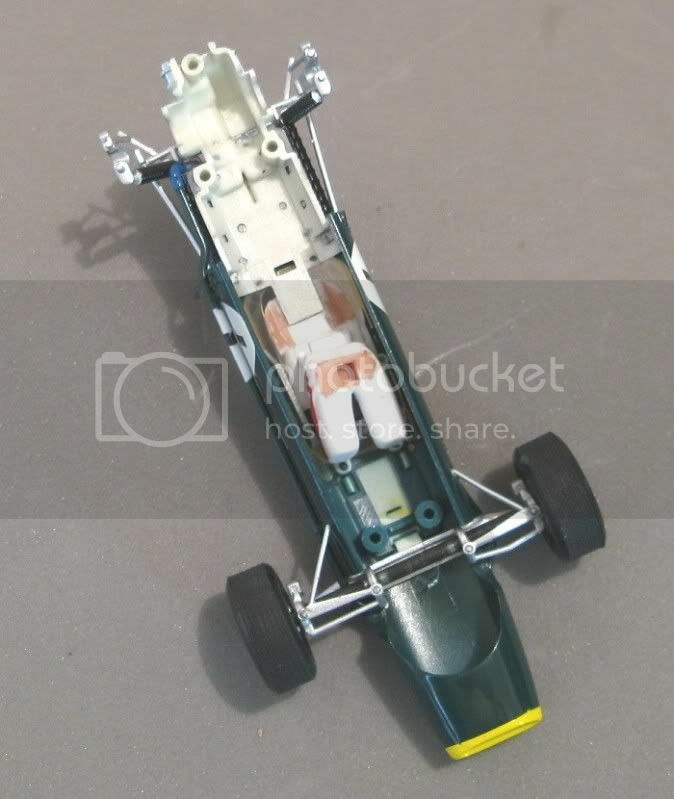 One last observation would be that if you are taking this model apart and especially if you are removing the motor for whatever reason, make sure you do not loose the miniscule sleeve Scalextric have slid over the pinion shaft. This is here to increase the shaft diameter to match the slot in the pinion. If you drop this on the floor you may never find it again and the mis-mesh generated by running it without it will wreck the gears fairly smartly. So from the outside the model has that ‘come on!’ appeal. What about the inside?? As expected, the inside is filled to the max with functional parts. 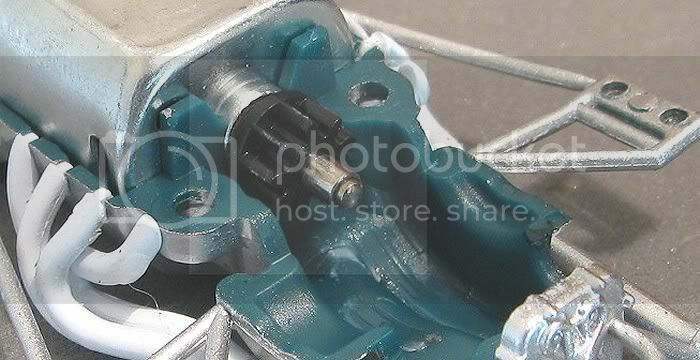 The motor, contrate, RI components and front suspension are pretty much occupying the vacant space. The unseen parts of the driver take up what’s left, so, unless you take something out, you’re not going to get anything else in, like ballast! But for the magnet racers all is fine. 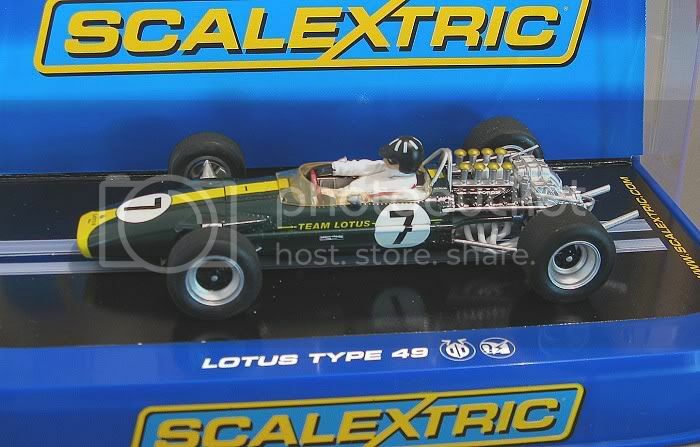 The model weighs in at an amazing 48 grams and combined with the FF motor this is guaranteed to be another pocket rocket from Scalextric. On plastic it is unshakeable. 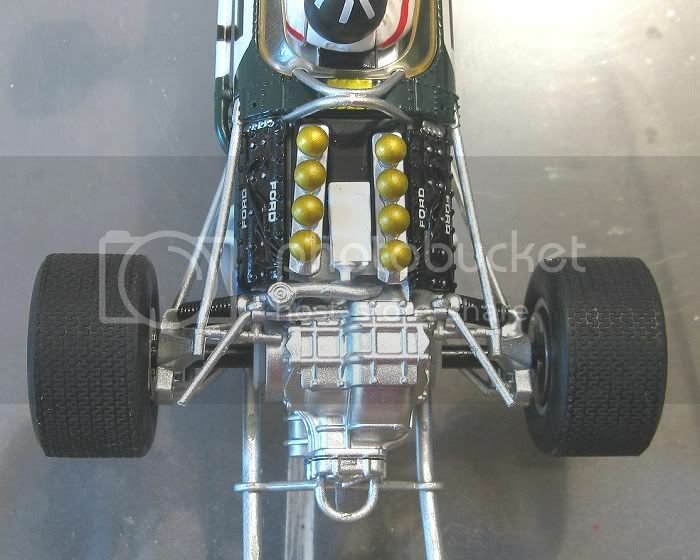 The button magnet has little work to do and it is only the fact that it has treaded tyres on the rear makes it just a little bit nervous in some corners. Straight line acceleration is blisteringly quick for a motor rated at 18,000 rpm and disaster too is blisteringly quick. No matter, this is truly a model for the SCM on plastic but what about the needs of the more talented board track racer?? Mmmmmmm? 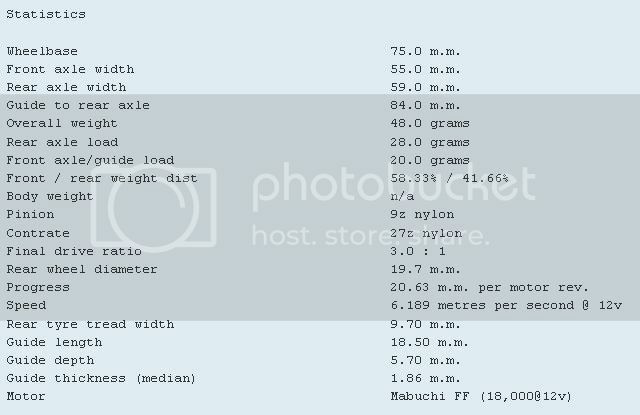 At 48 grams and with the current motor I suggest that unless the model is disfigured with unsightly external weights or savaged internally to accommodate a little more ballast then the best, (and my preferred) option is to turn down the power!! These models come rated for 12.0 volts and are inevitably run on uprated power supplies at 14.0 volts and more when what we should be doing is turning the power down!! Knock it back to 10.0 volts or less. They drive magnificently at this and are far more predictable, and if you have an F1 class for these, with everybody running at the same voltage what’s the big deal. I call it the NC1 syndrome. 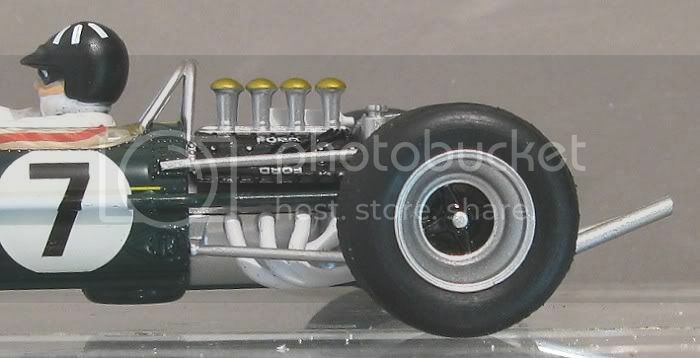 Some of the closest and most exciting slotcar racing can be achieved with slower models. So now we have the creature tamed for the track, what is it like? I have run this model on the Red Team’s two lane board track and with a couple (6) of ohms dialled into the power supply the model was a peach to drive. The patterned tyres allowed the model to tail out controllably and acceleration on the straights was still impressive even though it wasn’t break neck. Pure driving pleasure created mostly by the sight of the model running on a well landscaped track. I don’t need to pit this model in mortal combat to enjoy it, I just need to see it running against like. 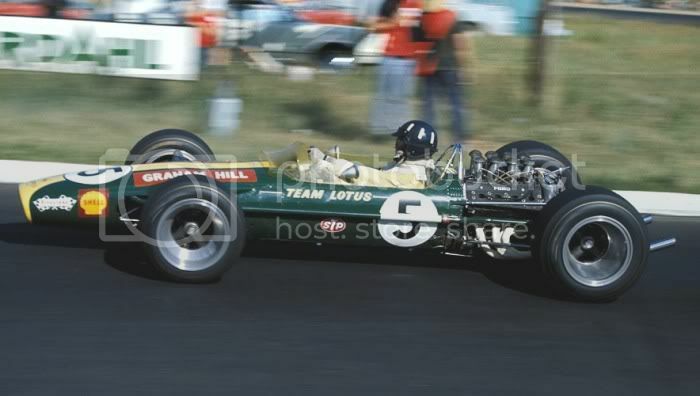 The 'Gold Leaf' Lotus....minus the 'Gold Leaf'?? I will have plenty of fun with this model and hopefully it will see some competition because this is what it was purchased for! Will I cry when the crooked exhausts get smashed off or I loose the rear view mirrors or the front suspension becomes a mangled wreck?? Probably! But hey, no pain – no gain! And there’s still a couple in the cabinet I can smile at when I walk past !!! 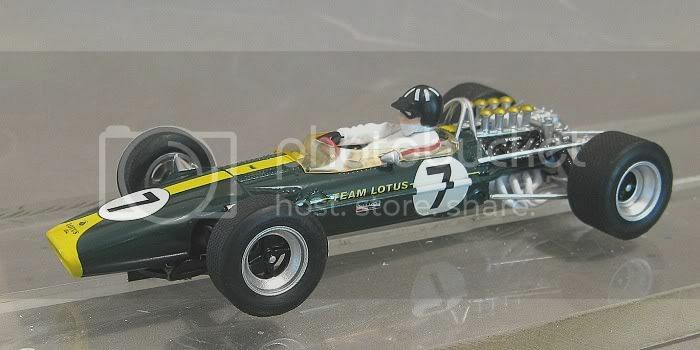 Many thanks to member Peter Shannon who has diligently searched the internet for a picture (or two) of the Hill Lotus and Yea it does have a tinted screen. Very much like the sodium tinted sunglasses skiers used to wear!!! Halcyon days! Excellent review. It is disconcerting that there were assembly errors. Mine didn't have those, but there was a slight rub in the drive. The motor shaft retaining rim on the crown gear had a "squeeze" in it that rubbed the motor shaft every revolution. I've seen this many times before on all kinds of slot cars, so the repair was nothing at all. But all my bits a pieces of motor details were properly aligned and the exhausts were perfect. I almost broke them off when sanding the tires true, but that was a slip on my part. I've since heard of a Tasman car with the defects too which isn't good. The upside is that I gave mine a run last Saturday on a four lane Ninco track and it fare screamed around the circuit. At a guess I'd say it was not that many tenths slower than the Fly March 761!! Trouble is my old neck can't keep up these days!! 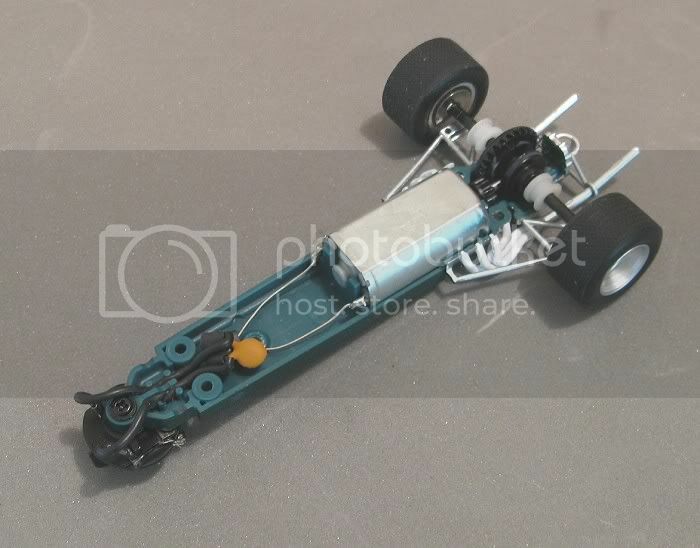 Its a long while now since I had it apart, but I have raced it successfully in more recent times on a painted magnabraid track where it worked quite well on MJK urethanes. One plus though is that one sided exhaust was knocked off in one of the heats and when I reglued it I put it back on straight!! Can't see me knocking the ram tubes off though! I will leave it as is then, run it with the flaws.